One odd sight on the "Queer Eye for the Straight Guy"-type shows is of gay men fussing over the wedding tuxedo s and silky gowns of their straight subjects. There's sweetness, affection, and expertise in the act, and yet there's cold irony, too. Gay men can't marry their partners in most states, even if they can protect blushing marrieds from oily skin and lighting gaffes from coast to coast. A&E's "Wedding Wars," tonight at 9, frowns directly at this inequality, and yet it is anything but didactic. The made-for-TV movie takes all of the tense political and moral lather about gay marriage in the United States and folds it into a frothy romantic comedy that refuses to take itself too seriously. Like "Will & Grace," "Wedding Wars" lightens the issues in order to disarm viewers, to clear away the controversy and hostility for some friendly funning. And it succeeds as a charming, silly, and idealistic piece of whimsy along the lines of "In and Out." The movie, executive produced by Craig Zadan and Neil Meron of "Chicago" and the TV biopic of Judy Garland, is bound to attract an audience thanks to its high-profile casting. Two of TV's most visible actors, both now known for playing doctors, are the movie's polar-opposite brothers. Eric Dane , McSteamy from "Grey's Anatomy," is uptight Ben, a speechwriter who is engaged to the Maine governor's daughter, Maggie (Bonnie Somerville ). 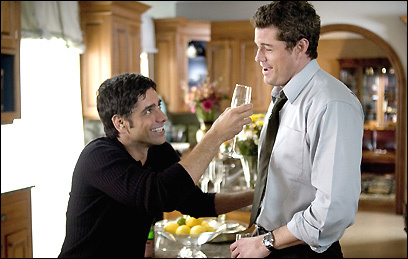 And John Stamos from "ER" is Shel, a gay party planner hired to handle the wedding arrangements and make sure the champagne is worth popping. Don't expect Stamos to carry the "brave performance" airs reserved for straight actors who play gay; he breezes along in the larky spirit of the movie. He doesn't flame it up, even when the script gives Shel stereotypically gay lines about working his calves . Stamos just behaves like many of the straight characters he has played -- warm, slightly neurotic, cute as opposed to hunky. Dane is the hunk in this movie, and he is well cast-- a wooden actor playing a wooden character. All goes swimmingly with the brothers, until Ben writes a speech read by the governor (James Brolin) in support of an amendment against gay marriage. Shel recoils, walks off the job, and begins a one-man protest outside the governor's mansion. Radicalized, he marches back and forth alone with his sign, a dear, committed nut who can't even muster support from his boyfriend, Ted (Sean Maher ). "What are you doing?" asks the annoyed Ted. "You don't even watch the news. Anderson Cooper doesn't count." Soon enough, Shel becomes a media hero, and he inspires a national strike by gay and gay-friendly people, many of whom journey to Maine to march. (Coincidentally, Paul Rudnick's new play, "Regrets Only," shares the same gay-strike theme.) Ben is particularly enraged at what he calls his brother's "Norma Gay routine," but his efforts to quash the strike fail. He and Maggie are left searching for a new wedding planner, finally coming up with a lady (played with comic insanity by Linda Kash ) who is the definition of tacky. Will the country develop bad hair overnight? Are the nuptials of Ben and Maggie doomed to gold lame? Will pressure from the strike change the governor's mind? Will Ben develop a new appreciation of his gay brother? Will Shel settle for civil unions? Some of these questions are answered in this likable A&E fantasy, while the rest are left completely open-ended. After all, no one really knows just what kind of changes this kind of grass-roots activism might inspire. Matthew Gilbert can be reached at gilbert@globe.com. For more on TV, visit boston.com/ae/tv/blog/.